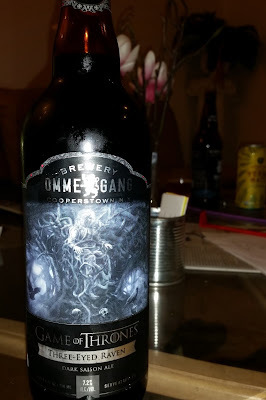 Ommegang Game of Thrones Three-Eyed Raven - AoM: Beer et al. I thought this beer smelled strong (alcoholic fumes). Michael said it smelled like a normal dark beer. Afterwards I picked up scents of bread and wheat. Josh didn't like it. He thought it tasted weird. It's possible this was due to the beer not being cold enough. FROM THE DARKNESS I WATCH YOU. ALL OF YOU, ALL OF YOUR LIVES, WITH A THOUSAND EYES, AND ONE. 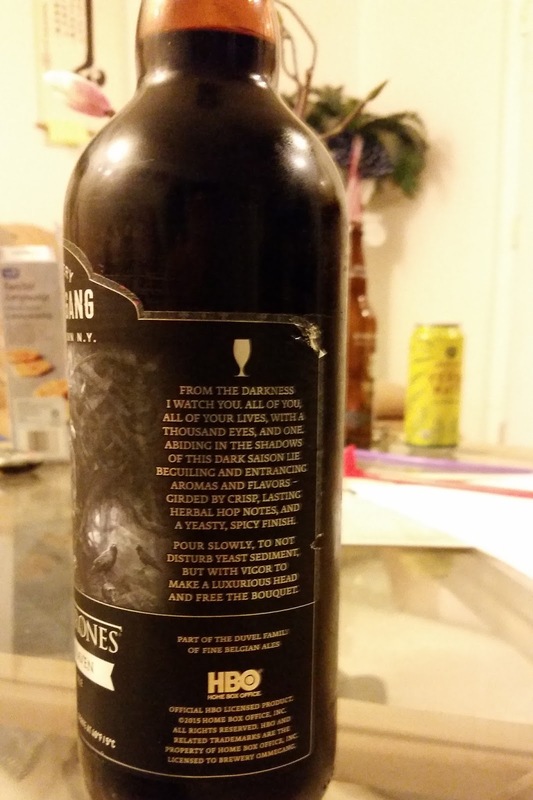 Push through the thick brambles and present yourself to the Three-Eyed Raven. 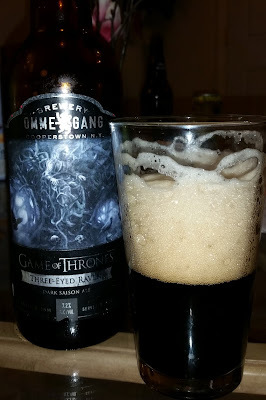 Abiding in the shadows of the Three-Eyed Raven lies this deceptive Dark Saison. The ominous Three-Eyed Raven inspired us to brew a Dark Saison ale, a hybrid style open to brewer’s imagination. In the end it is neither a pure saison nor your typical dark beer, but instead a delectable blend that both deceives and thrills the senses. Three-Eyed Raven makes for perfect season premiere pairing. 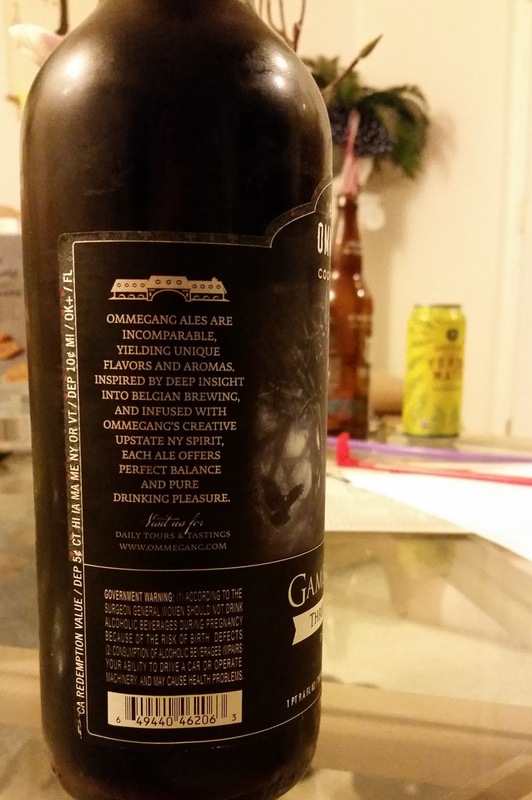 On sale April 2015, available in 750ml bottles and 1/6 barrel kegs. Three-Eyed Raven harbors a deep dark brown, almost jet-black color with a light tan head. Yeast forward aromas are packed with peppery phenolics and fruity esters. Despite what you might expect from a dark hued beer, the flavor brings to mind a traditional saison: a light, malty body with a hint of sweetness, and roast accentuated by herbal and spicy hops, yet underpinned by pleasant yeastiness. Finish is crisp, with lingering notes of herbal hops and Belgian yeast. Malt: Our carefully crafted mixture of specialty malts. Available on draft and in 750ml bottles. Pair with roasted chicken and pork, barbeque and other spicy dishes, grilled vegetables, goat cheese and smoked gouda.